Hi folks a bit dull and dreary here! Never mind means more crafting time and blogginh time,Lol. Today I have another Christmas Card for you to look at, hope you like! 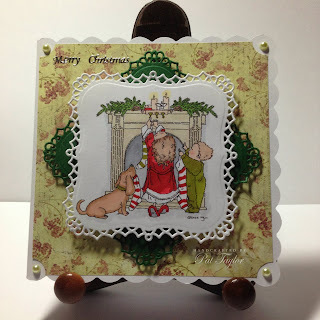 Mo Manning Digi Stamp "Hanging the Stockings"
This is such a cute image you give such a variety of cards to give us inspiration. Lovely cute image, coloured so well, great card. A fabulous card with a beautiful image.